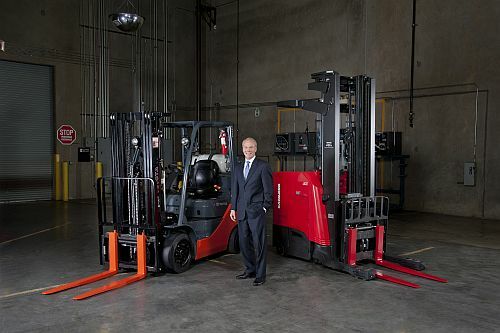 As president and CEO, Wood leads TMHNA, a company comprised of Toyota Industrial Equipment Mfg., Inc. (TIEM); Toyota Material Handling U.S.A. Inc., (TMHU) and The Raymond Corporation, the leading provider of narrow aisle electric lift trucks in North America. He also is chairman of TMHU, supplier of the number one selling lift truck brand in the U.S. since 2002. In addition, Wood serves as a board member for The Raymond Corporation and for TIEM, Toyota's zero-landfill forklift manufacturing facility in Columbus, Ind. "I am honored to have been appointed to the boards of MHEDA and MHI, two essential organizations in our industry representing material handling dealers and companies," said Wood. "Together, with my fellow appointees, we look forward to supporting the interests of our members and raising the visibility of the material handling industry and its importance to the U.S. economy." Wood is a member of the Industrial Truck Association (ITA) Executive Committee and Board of Directors and previously served as the ITA's chairman of the General Engineering Committee. He contributes to bothModern Materials Handling magazine's editorial advisory board and the Electric Power Research Institute's Industry Advisory Council. In addition, he sits on the advisory board for SafetyBeltSafe USA, the national nonprofit organization solely dedicated to child passenger safety. Wood also serves on the board of Team Kids, a nonprofit organization focused on empowering children to change the world, and the California State Soccer Association.